Bachelor in Mathematics by the Universitat de València. Ph. D. in Mathematics by the Universitat Politècnica de València. Professor of the Departament de Matemàtica Aplicada of this University from October 1983 to September 1991. 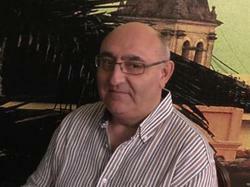 Professor of the Universitat d'Alacant in the Departament de Ciència de la Computació i Intel·ligència Artificial from October 1991 until August 2009; member of the "Grup de Computació en Paral·lel" (from October 1991 until December 2001), member of the Unitat de Criptologia i Seguretat Computacional (from January 2002 fins a octubre de 2013) and member of the Group of Algebra and Geometry (from October 2013). Professor of the Department of Mathematics (formerly Department of Statistics and Operations Research) from September 2009 and director from November 2014. Director of the Secretariat de Promoció del Valencià (currently Servei de Llengües i Cultura) of the Universitat d'Alacant form March 1998 until Frebruary 2005. Member of CriptoRed from December 1999, ALAMA from December 2007, and MatSI from January 2009. Member of the Editorial Board of Advances in Mathematics of Communications (AMC) since November 2008. To contact me via email, click on CONTACT on the right side and fill in the appropriate form.